No, not that time. Foodie PenPal time! What is Foodie PenPals? Lindsay over at The Lean Green Bean and Allie over at Healthy Balance, Healthy Lifecame up with the idea for people who blog and people who read blogs to be part of a penpal style exchange of foodie items! It has introduced me to many new blogs that I love. If you want to check out what I sent to Mercedes at Satisfy My Sweettooth, click the link. Without further ado! Here are my goodies from Samantha at Running & Cupcakes. Cowboy Ketchup – Waiting to grill burgers for dinner. Jeremy cannot wait to dig in. 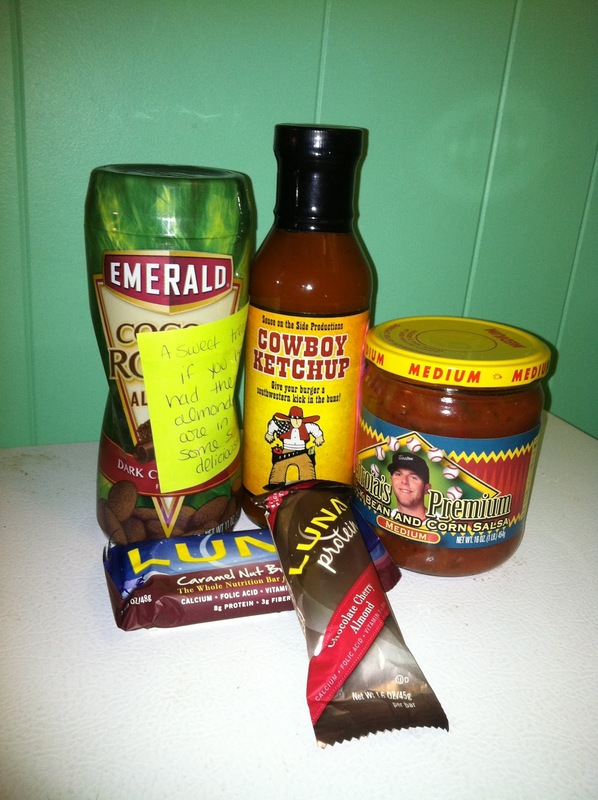 Pedroia’s Premium Black Bean and Corn Salsa – I always thought salsa was salsa. This is delicious. Luna Bars – a Caramel Nut and Chocolate Cherry Almond, these are being saved for my next hike. those dark chocolate almonds are the freakin best! I've never tried those cocoa almonds! Are they chocolate or cocoa? Sugary? Sweet? Bittersweet? DO TELL, they look awesome! Cowboy ketchup?! I must find this! They are dark chocolate Allie, and the coating reminds me of hot chocolate. Like they were wet and coated with hot chocolate and then baked. Super yummy!